“Now I am rich!” said the Prodigal Son after receiving his inheritance from his five-year-old father. Two girls from KG3 walked up to him and waved coyly. “Heeey laaadies!” he said. The girls put their arms around him and they walked off together. Stephen and Ravena, Alexia’s mother, couldn’t make it to KG3’s graduation and the SOS Kindergarten’s Christmas pageant, so I was Alexia’s "honorary mom" for the day. She’d already started calling me “mommy” so the transition was simple. I even stopped by her classroom early this morning to drop her off before the event and attend a parent-teacher conference. What was a graduation for five-year-olds could have easily been a college graduation with the twenty-plus long-winded speeches, not to mention four prayers and a lengthy sermon. Each person started their speech by saying they wanted to direct it at the students of KG3 as it was “their day” then rambled on for so long about random things that not only had the kids lost interest but many of the parents had too. I couldn’t even tell you what most of them talked about because frankly I stopped listening about three hours into the ceremony. However, I did catch a few phrases of one woman’s speech in which she used the saying “monkey see, monkey do” and instructed parents to feed their kids “fruits and vegetables with lots of protein”. The only time I really paid attention was during the sermon because he offered a refreshing perspective about success which completely contradicted the one I’d heard at GGV church about success being measured in wealth. Then he went off on a tangent about rich people committing suicide referencing to such people as Michael Jackson who “had all that money…he died because he had money but he didn’t know how to manage money. He spent all this money on plastic surgery and first his nose looked this way” he said, pointing to the right, then to the left, “then this way, and then down”. The audience was attentive at this point and had starting laughing. I’d love to plan a debate between him and the pastor at GGV. And five hours after I’d first sat down in the hot afternoon sun, we were free to go. The thirty or forty minutes that the adorable kids spent in front of the audience made up for the rest of it, well most of it. I’m really going to miss those kids! As we were leaving, a song came on that I liked and I asked the DJ what it was. It's called "Furi Furi Dance" by Jimmie Gait. “My daughter, you know her” said the director of Meru Teacher’s College. “She is the big, big girl in KG3” he said. I thought I might know who he was talking about, but her name isn’t Promise. I also didn’t want to let on that I knew who he meant based on the description he’d given. I felt bad admitting that she may be a little overweight. It turns out I did know his daughter, but I knew her by her second name and he was calling her by her English name which I’d never heard before. I had contacted the director of Meru Teacher’s College last week to talk to him about finding volunteers to continue my projects after I leave. He was supposed to meet me yesterday at the office but never showed up. Today I was working in my office when he walked through the door. I told him the various projects I need volunteers for and which types of people might be best suited for each position, in terms of their majors and interests. He said he’ll talk to some of the professors to help him find students who may be interested. Sounds relatively promising! "Here, play this" the teacher said, pointing to the waist-high drum she'd just carried into the room. It was my first day volunteering with KG2, Alexia's class, and they'd taken a break to do some dancing. They sang a couple of songs which I clumsily drummed along to. I didn't think it sounded half-bad though. "Let me help you." She walked over with a permanent market which she used to tap the wooden side of the drum, hitting the top with her left hand. "You can dance with the students." I'd been demoted. Probably for the best. I preferred to dance anyway. We went outside to meet up with the rest of the kindergarten so they could practice for their upcoming Christmas pageant. They sang some songs and then they asked me to teach them one. Why are they always asking me to teach songs? I don't know many childrens' songs. "Teach them Jingle Bells" said one of the teachers. A few students heard her and started singing the chorus, soon the rest joined in. "I think they already know it" I said laughing. "Teach them. From the beginning." "Uh alright. I'm not a very good singer." "That doesn't matter." That's what you think... I'm a horrible singer. That's not me trying to be modest, I'm genuinely awful. The singing concluded and the kids were given a couple of minutes to run around. One of the teachers tried to do a handstand and soon she had a group of students around her doing handstands and somersaults. They're a bunch of breakdancing acrobats! "Am I your little angel?" asked Alexia after I hugged her. I burst out laughing, "Barita, did you hear her?" "Alexia just asked, 'Am I your little angel?'" "Yes, of course you are" Barita told Alexia. "Sometimes" I told her, joking. This morning I taught the oldest kindergartners in KG3 about Halloween. They must have misheard me when I told them how to say "trick-or-treat" because each kid who came to the door to get their lollipop said "chickie chickie" to me. I stayed afterward for my usual weekly volunteering at the kindergarten. The class was told to write the numbers 1-5 on five dashes in their notebooks and I went around and marked their work. Instead of going to PE today, all of the kindergartners met in KG2 to practice songs for the upcoming graduation and Christmas pageant. I sat on the side and clapped and danced along, not knowing any of the words to the Kiswahili songs. On the way back from buying food for that afternoon's food drop, I noticed the post office had "University of Nairobi" painted along the top of the building's facade. "Why does it say 'University of Nairobi' on the post office?" "The university has a campus there. They rent classes in the office." All I could think was how random it would be if Northeastern started offering classes in the post office on Mass Ave. I went back to SOS to pick Alexia up and when I got to the classroom the kids started shouting "Gwen! Gwen!" I laughed, "Hi! Did you have a good day?" After saying yes they continued to repeat my name. Alexia's response? "They're playing with your head." Where does she come up with this stuff? Later that night in reference to the Halloween photos I had shown her class, Alexia said, "Those pictures which you showed us, you looked like a grandmother." I was dressed as a witch. This afternoon was our second food drop for the elderly women who work at the tree nursery in town. I expected them to be sitting at the bottom of the hill amid the trees when we arrived, but they weren't there. Turns out they'd relocated further down the road where it was warmer and drier. As soon as I got out of the car I was ambushed and hugged by the majority of the women. And then the dancing started. I am one of the most uncoordinated people you'll ever meet, so their dance, which involved stepping forward with one foot while swinging both arms forward, far surpassed my skill level. One of the women realized how awkward I looked and decided the best cure was to push me in the center of the ring to dance on my own. They brought over stools draped with cloth doilies for us. I felt like I was sitting on a throne and really would have preferred sitting on the grass with the other women. Nothing here seems to start without a cup of tea and a prayer and today was no exception. Scattered behind the women were ten or so brightly colored thermoses. They brought over a bucket full of teacups and poured Dorcas and I cups of steaming hot milk. I was expecting the usual masala tea, but they had packets of instant coffee for us instead. Next came a platter of arrowroot, quite possibly one of the strangest foods I've ever eaten and I've tried some weird stuff (warthog, crocodile, and termites to name a few). 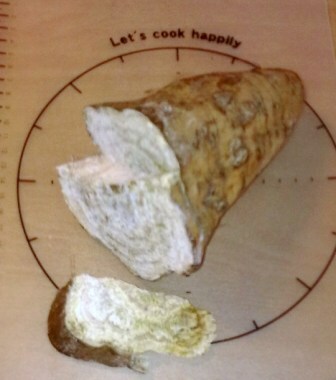 The arrowroot is cut into chunks and boiled. It's like chewing on a block of starch. I finished the smallest piece on the tray, the size of my fist, and I was uncomfortably full. They brought the tray back over, piled with another six or seven pieces. "They want us to finish" said Dorcas. "Wait what?" I'd eaten one to be polite, but there was no way I was going to finish that tray. Besides, weren't we there to give them food. She laughed and told them in Kiswahili that we couldn't finish it and they should pass it around to the other women. Still they insisted. Dorcas, realizing they weren't going to give up, asked them to wrap up the arrowroot in a bag for us. And then came a second round of coffee. "Hapana hapana. Asante sana!" I said, meaning "No no. Thank you very much!" That's about all I knew how to say in Kiswahili in this situation. Dorcas also refused a second cup. A couple of minutes later the leader of the group poured herself more while muttering in Kiswahili to Dorcas that it was the cup she had "refused to take." "And we do something called trick-or-treating. Can you say trick-or treat?" I spent the morning teaching KG1 at SOS Kindergarten about Halloween. It isn't celebrated in Kenya and most people I've asked about it have never heard of it. I really can't imagine my childhood without Halloween so I hoped the kids would enjoy learning about it. "Hi everyone! How are you today?" "That's good! I come from the United States, all the way across the ocean. Where I'm from we celebrate a holiday called Halloween. Can you say Halloween?" "Great! And it is my favorite holiday. All of the kids dress up in costumes and go to their neighbors houses to do something called trick-or-treating. Can you say trick-or-treat?" "Right. The kids knock on their neighbors doors, say 'trick-or-treat', and the neighbor gives them a sweet. Can you practice with me? Knock on the door" I said making a knocking motion in the air. "Now say 'trick-or-treat'" they all repeated after me. "And then you get a sweet" I said, holding out my hand; they did the same. I went on to explain that one Halloween tradition is to carve pumpkins with "silly faces". I told them the pumpkin I had made them was special and just for them because the back said 'SOS' on it. Then I explained that when I was in Kindergarten we would wear our costumes to school and have a big parade. I showed them photos of my friends and family dressed up for Halloween. "Look! That's Teacher Gwen" the teachers said, pointing to the witch second from the right. I gave each of the kids a blank paper plate to color. They didn't really understand the concept of making it look like an animal or a face, so they all ended up with abstract masks. "OK, now we're going to play a fun game called pin the tail on the black cat. What you do is you close your eyes" I closed my eyes, "spin around three times", I slowly turned around, "and put the tail on the cat". I staggered to the board with my arms outstretched and missed the cat by a few inches. When I opened my eyes they already had their hands up, wanting to play. The teachers found a piece of cloth to use as a blindfold and the first girl walked up to the board to try the game. She spun around, almost into a chair, until I nudged her in the right direction. A few more kids went and then a boy walked up and began to spin. He stopped spinning and started walking right towards me, arms outstretched, like a little zombie. He was about an inch from sticking the tail on my shirt before I spun him to his right, in the direction of the board. "When I was in kindergarten my school would always play the same song which meant the Halloween parade was starting. It is called the 'Monster Mash'. I am going to play the song and when you hear it, line up by the door outside like you're getting ready for PE. Then you will come to the door one at a time and say 'trick-or-treat' and get your lollipop." We tied the masks on all of the kids and I started the song. They got us and danced their way outside and then back in again, getting their candy on the way. Their teacher led them in a loop around the classroom and they followed her, dancing all the way back to their seats. I thought Alexia was already in bed, but she wandered back into the dining room wearing Stephen's sweater as a dress over her pajamas. I was on my computer doing work and she told me, "When you are done with your homework, you go to sleep. You can't be late for KG2 tomorrow!" "Oh yeah, I completely forgot I'm in KG2 tomorrow. You remembered!" "Mmhmm. We will do projects?" "Goodnight Mister Gwen." I've started calling her "Alex" and in return she has taken to calling me "Mister Gwen". We never got around to carving the pumpkin in Nanyuki, so I brought it home and asked Alexia if she wanted to watch Hocus Pocus and help me carve it. After struggling for several minutes to carve out a lid, I gave Alexia a spoon to scoop out the pumpkin guts. "Gweeeen, what will it look like?" "I don't know yet. Maybe something like this" I showed her some examples online. "What picture should we put on the front?" I traced a stencil of Mufasa and Simba then held it up to the pumpkin. Maybe I was being a little too ambitious. I had a hard enough time cutting a large hole in the top of the pumpkin, how was I supposed to carve out these little details? Kenyan pumpkins just aren't the same as the ones I'm used to carving back home. I opted for a simple, but classic Jack-o'-Lantern face. I started carving and knew right away that there was no way I could let Alexia help. She didn't seem to mind when I told her.